From letting prisoners vote to free college, are 2020 Democrats pandering to voters? The Morph is a fun little computer peripheral. The small trackpad uses a series of silicone covers to recreate different interfaces, from a QWERTY keyboard to a drum pad. Ultimately, however, it’s the tech that drives the product — rather than the product itself — that may prove the most useful. Sensel was on-hand at CES this week, in a much larger booth than the year prior. The Morph took up a chunk of the area, including a musician using different pads to play songs live. But the startup’s real star of the show were a series of thick, unbranded tablets. In a meeting with TechCrunch this time last year, the company noted that it was essentially shopping around the underlying technology for other uses. In a sense, the Morph is as much a way of proving that Sensel’s technology truly works. Pressure Grid offers an alternative to more traditional capacitive touch, essentially building positional touch and force touch into a single sensor. It’s a less expensive way to accurately determine both the position and pressure (from 1g to 5kg) in one go. 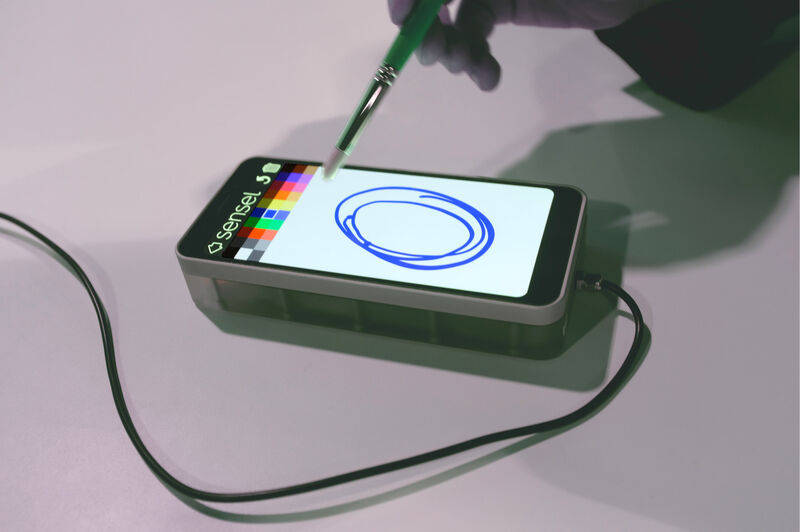 It’s also thin and capable of working with flexible displays, making the company well-positioned for what could well be the next wave of mobile devices. And, as the company was more than happy to demonstrate on the show floor, it actually works underwater. Because what’s the fun of a waterproof phone, really, if you can’t use wet fingers? Another key benefit here is the ability to detect objects beyond the finger — that could mean using it with a pair of gloves or taking a regular old paintbrush to the surface to draw some art. Sensel says it has built fail-safes into the software, to cut down on false positives, which could definitely present an issue for a device that can register just about any object that comes into contact with it. Sensel says it’s already begun working with industry partners to implement this technology into commercial devices. Of course, like 3D touch before it, incorporating pressure sensitivity is going to take some customer training to make using it a natural part of day to day computing. Next articleScooter startup Bird tried to silence a journalist. It did not go well.